Night Full of Family Fun!!! 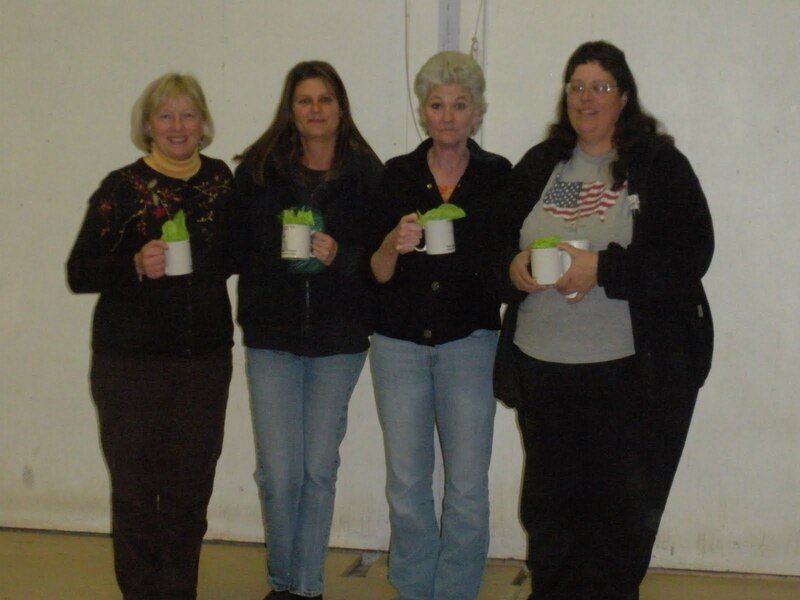 Family Fun Night was held on Saturday, November 19 at the the fairgrounds. Despite the cold we had over 150 people show up for a night of family fun. We had Minute to Win It games, cake walk (which was out of cakes by 7 pm), and pizza and cider. Thanks to the fairboard for letting us use the facility and to Sharon Dalton, fairboard member, who came and helped all night and Patti Speelmon for all her work with the games and cake walk. We would also like to thank Litehouse for the donation of the fabulous cider and Panhandle State Bank for the bottled water. The BC Leaders Council also purchased all the pizzas. Before the crowds showed up in the Main Exhibit Building. Cakes and goodies waiting for the cake walk to begin. 4-Corners 4-H club information table. The 2011 Leader of the Year, Amy Sawyer. Join us for the 2011 Family Fun Night on Saturday, November 19th from 6-8 pm at the Fairgrounds. This event is free to all and hosted by the Bonner County 4-H Leaders Council and the Bonner County Fairboard. There will be games, cake walk, music, door prizes, leader awards and pizza for all. There will be area clubs on hand to answer questions about their club and the 4-H projects they offer. The following is an article that appeared on CNN.com. It could explain a lot! Hillary Tillotson, 19, and Tessa, 15, are sisters who have acted out as teens. (CNN) -- It was hot at 3 a.m. in a small town in North Carolina, and there wasn't a lot for a group of teenagersto do. So, Hillary Tillotson, her brother and three other guys sneaked under a fence to go swimming at aprivate pool down the street. Only Tillotson and her then-boyfriend kept their clothes on, she said.Two days later, a cop showed up at Tillotson's house. Some of the teens' accomplices had been braggingabout their skinny-dipping adventure, and someone turned them in for trespassing. She and her brother hadto go to court; their mother paid the fine. "Sometimes I wonder where their brains are at," Tillotson's mother, Lori Lee, said of her children. "They dosuch impulsive things, and sometimes I just don't think they're thinking." Neuroscientists confirm that teenagers do have brains, but they're wired differently from those of adults. Why many teenagers seek thrills, break rules and seem nonchalant about their own safety has been a question brain scientists have worked to answer in the last two decades. Top researchers use functional magnetic resonance imaging to see this brain activity. A new study in the journal Nature found that structural changes in adolescents' brains correspond to fluctuations in IQ over time, with some young people improving and some falling back on these tests. Teens improve at such tests at different rates, and it's difficult to know how someone will do a few years after the initial assessment, said study co-author Cathy Price at the Wellcome Trust Center for Neuroimaging. It's not yet clear whether fluctuations seen in this study are unique to this age group, or whether they would be similar across a lifespan. Scientists typically refer to "the teenage brain" in 13- to 17-year-olds, but that doesn't mean that college students are totally "adults" yet. In fact, research from the National Institutes of Health has shown, the prefrontal cortex, a region of the brain associated with inhibition of risky behavior, doesn't get fully developed until age 25. The connections between the prefrontal cortex and other areas of the brain are also developing in teenagers. And a number of deep structures in the brain are influenced by changes in hormones, which may lead to heightened emotions. The way that brain regions talk to one another in teenagers may explain teens' sometimes confounding behavior, scientists say. Even in their mid-teens, adolescents can make quick, efficient, correct decisions; in the heat of the moment, though, the brain's deep emotional centers will win out over reason. "It's not like these brain parts aren't there. It's how they get wired and become fine-tuned with experiences," said BJ Casey, director of the Sackler Institute at Weill Medical College of Cornell University. Adolescent: The Essential Guide for Ages 10 to 25," has done research in this area. He found that when teenagers are in the presence of friends, the reward system gets aroused even more. "It's not that adolescents don't understand risk. They understand it perfectly well," says Beatriz Luna, a neuroscientist at the University of Pittsburgh. "It's just that they find it more rewarding to impress their peers, and things of that sort, than the risk that's involved to their actual survival; it's just what they value at that point." This would help explain why teens give in to peer pressure more easily than adults or instance, in breaking the law to jump into a pool in the middle of the night, as Tillotson did. "I'm not someone who makes big mistakes like that. I'm usually the goody-goody in my family," says Tillotson, 19, of rural North Carolina. Her 15-year-old sister, Tessa, is the family's rebel, their mother says. It's not unusual for Tessa to sneak out behind her mother's back and go to the park. "I don't like my mom to say no," Tessa says. There's an evolutionary explanation for this kind of behavior: In most mammals, adolescence is the time when individuals leave the family environment, Steinberg said. Sensation-seeking leads pubescent creatures to go find sexual partners and a social structure outside the home. They need to become independent of their parents and adapt to new surroundings. Venturing out into the wild and leaving the security of parents is a risky thing to do, so there must be some built-in biological mechanism to ignore the potential dangers of the wild, scientists reason. "If it didn't happen, we wouldn't leave home and reproduce," Steinberg explains. The reward-seeking brains of teens may lead them to experiment with pleasure-inducing substances like drugs and alcohol, which are especially dangerous for this age group, scientists say. Since vital structures in the teen brain are still developing, adolescents are more prone to brain damage from drugs and alcohol. Research has shown that teenagers who binge drink will have greater brain damage than adults. And teens are more vulnerable to stress, which may lead to an increased risk of depression later in life. Marijuana can stay in a teenager's system for days, impacting the building blocks of learning and memory. That's because the teen brain probably has more receptors drugs to bind to -- the same is true for alcohol. And in teens who regularly use pot, IQ can permanently decrease, research has shown. On the plus side, teens are rapid learners, since their brains are still developing. But that also means they can get "addicted faster, longer and stronger," Dr. Frances Jensen said at TEDMED in 2010. That's because addiction is related to learning and memory; teens may be able to pick up a language faster than an adult, but they can also develop dangerous habits more easily, too. So what's a parent to do? Steinberg says it's a lot harder to change the reward-seeking predilections of teenagers than to restructure the environment in a safer way. Parents can make sure kids don't spend a lot of time unsupervised. For instance, they can enroll teens in healthy after-school programs where adults are present. On a societal level, raising the price of substances such as alcohol and cigarettes would curb teens' use of them. This would produce a greater change in behavior among young people than education programs,research has shown. That's not to say that kids can't learn from their mistakes. There's a broad spectrum of sensation-seeking and tolerance for risk among this age group, so some teens won't get into as much trouble as others. And even though they may be saying "Get out of my face" when you offer advice, they may be listening and need your support, says Luna, the University of Pittsburgh neuroscientist. Steinberg said. Find an incentive that gets your child motivated -- for example, give a bonus in allowance when he or she does something good rather than taking away money as a penalty. As for Tillotson, after the pool incident, she had to do 40 hours of community service for the chief of police, and she was on probation for six months. Her mother made Tillotson and her brother, who is older and doesn't live at home, earn money to reimburse her for the fines she paid for them; Tillotson is halfway there. "I think that's one of the best decisions parents can do for their children: Make them accountable for their actions," said her mother, Lori Lee. "All teenagers act on their impulse just out of instinct," Tillotson said. "It's like ripping off a bandage; you just want to do it quickly, not thinking about it. But what you don't realize is that you can tear skin. There's consequences." © 2011 Cable News Network. Turner Broadcasting System, Inc. All Rights Reserved. Do You or Someone You Know Want to Form a Club? Does Nancy Have Your Current E-Mail? Nancy will be off for most of December to use up some of her comp and vacation time before they take it away. The annual fall meeting of the Bonner County Leaders Council will be held on Monday, October 17 at 6 pm in the Extension Office. All certified leaders are members of this council and should plan on attending to be part of the any decisions needed to be made regarding the 4-H program. We will be cover 2011 fair review, 2011-2012 budget, 2011 food booth report, family fun night, and go over any pending scholarships. Following the LC meeting, there will be a Leaders training workshop. We will be going over any new materials available, new information important to leaders and the new money handling requirements. This training will count toward your two hours of required update training. Nancy has scheduled one New Leader Training class for the 2012 4-H year. It will be on Saturday, March 3, 2012 from 9-12 noon at the Extension Office. Please let your new leaders know about this date and have them save it. If a leader needs to get going sooner or cannot make this date other opportunities for New Leader training is the on line course located at http://www.4h.uidaho.edu, go to volunteers, and e-learning for volunteers. Please let your new leaders know they must fill out a new leader application, which includes the background check information and schedule an interview with Nancy at the Extension Office prior to training. New Leader applications will be in the clubs enrollment packet. Do you or someone you know what to form a club? If you would like to form a new club for various reasons, please let Nancy know at the Extension Office. It is relatively easy to start a club and I have numerous materials to help you out. You need to have at least 5 members in your club, a name, a willingness to work with kids, and help them achieve their goals. If you are an 8th or 9th grader and interested in our local and state government, you need to find out more about the Know Your Government project. This is a county wide project and open to all 8th and 9th grader members. In February, members have the opportunity to travel to Boise to the statewide KYG conference. Call Nancy at the Extension Office if you are interested in learning more about this project. The club achievement packets should be ready to pick up by October 15th or you can pick up your clubs packet at the leader training on October 18th. If your club needs them sooner, please let Patti know. Also, any leftover project books or exhibits from fair will be given to clubs to distribute. If you won an award at fair, don’t forget to send your Thank you. We really appreciate our sponsors. Remember: Your club must turn in a financial report before they can receive their enrollment packets. Nancy will have packets and financial report forms at all the leader meetings. The 2011 fall Family Fun Night will be held on Saturday, November 19 from 6-8 pm at the Bonner County Fairgrounds. Clubs should plan on promoting their group to potential members. Table will be available for clubs to use. This event is open to anyone that would like to learn more about 4-H and celebrate the end of the 4-H year. As is the past, we will have door prizes, cake walk, games and food. We will also be given our Leader of the Year award which was selected by members and parents during the Fair. Donations are needed for door prizes, and the cake walk. Door prizes can be any unused item you may have around your house or donations you have gotten from community businesses. Cake walk items can be homemade or store bought, cookies, cakes, sweets of any sort. This event is hosted by the Bonner County Leaders Council and the Bonner County Fairboard. The BC Dog Leaders will hold a fall meeting on Wednesday, October 12 at 5:30 in the Extension Office meeting room. All dog leaders and interested future dog leaders should attend. We will be discussing policy changes and ideas for the summer dog education programs. The BC Horse Leader Council will meet on Monday, October 24, at 6 pm at the Extension Office meeting room. The BC MALC will meet on Wednesday, October 12 at 7 pm. We will be going over fair issues, 2012 budget, livestock judges for 2012, and more. Many Thanks to the Sandpoint Elks, Mountain West Bank, and the Bonner County Farm Bureau. Special cash awards of $5, $10 and $20 were given to numerous record books that met a standard of excellence. This award is generously sponsored by the Sandpoint Elks, Mountain West Bank and Bonner County Farm Bureau in order to recognize members who put an extra effort into their record books. Members receiving awards from the Elks are encouraged to send a thank you to the Sandpoint Elks, PO Box 1000, Ponderay, ID 83852. We appreciate the support they give the 4-H program. Does Nancy have your current email address? Stay informed and make sure you give your current email address to Nancy or Patti at the Extension Office. You can email either of us, niwright@uidaho.edu, or Speelmon@uidaho.edu with your email or questions. 4-H families are encouraged to send their email to be on the information list. The Extension Office is not closed - yet! 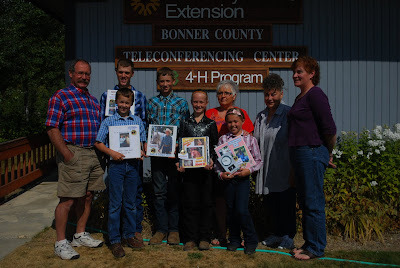 It has been a challenging couple of years for the U of I Bonner County Extension Office. County as well as University budget cuts and cutbacks have made us take a long look at what we're doing and how we are doing it. Another challenge we are facing is the consideration by Bonner County to discontinue funding for our local Extension Office, which includes 4-H. Bonner County Commissioners are contemplating whether the county should be funding departments that are not mandated by the state. In Bonner County, these include the UI Extension Office, the Bonner County Historical Society and the Bonner County Fairgrounds. It is important to remember, the commissioners are not denying these departments inpacts or quality of work, they are very satisfied; rather they are asking whether it is the responsibility of Bonner County to fund non-mandated programs and that includes Extension and 4-H. The County is administering an advisory poll that will be included in the November property tax statements asking if you want to maintain and continue these functions (Bonner County Extension Office, including 4-H, Bonner County Fairgrounds, and the Bonner County Historical Society) by using property taxes or user fees. Your response to this question must be returned with your December payment. There will be an informational meeting on Thursday, October 13, at 6 pm at the Sandpoint Catholic Church hosted by the Bonner County Farm Bureau. All those interested in learning more about this and what you can do are invited. Sandpoint Elks, Farm Bureau, and Mountain West Bank encourage 4-H members up the quality of their record books. Steve Klatt, Elks member, 4-H members with their record book awards; Derek Sawyer, Alex Mays, Clay Rasmussen, Kiah Mays, Kaycee Rasmussen, Patti Speelmon, extension office staff, Betty Kinney, Farm Bureau member and Nancy Wright, 4-H program coordinator. In an effort to show support for Bonner County’s exceptional 4-H program and to promote scholastic achievement in an atypical venue, the Sandpoint Elks Lodge began a program to award outstanding project record books a cash award. This program has produced gratifying results of improved quality and expanded efforts by 4-H members over the years, but was financially threatened by this restrictive economy. The Sandpoint Elks Lodge has partnered with two local business organizations as sponsors to continue the cash awards program for outstanding efforts in 4-H Record Books. Joining the Elks in this tradition to focus 4-H effort on the scholastic end of projects has been Mountain West Bank and the Farm Bureau Federation. The 4-H recipients achieving these $5, $10 and $20 awards have increased dramatically since this program began and this partnership assures continuity in rewarding local youth for efforts in narrating their projects. There is an impressive breadth to all the projects included in the local 4-H program and the volunteer efforts contributed by 4-H leaders are very praise worthy. The Sandpoint Elks & Partners program to encourage, evaluate and reward the required scholastic elements of all Bonner County 4-H projects has become a featured component of the local 4-H venue. We should take pride in how appreciated this program is by 4-H members and their parents, plus the 4-H leaders. The quality of record books continues to increase, young people are striving to win these cash awards, and the number of awards given has much more than doubled in a few short years. A program created to award cash bonuses to the top 100 record books reviewed, awards for the program rose from recent levels of nearly 180 recipients to exceed 210 awards in 2011. This year we judged record books on Wednesday through Saturday afternoons to evaluate the efforts put into these books and the quality produced put some pressure on the review committee. The Sandpoint Elks, Mountain West Bank and the Farm Bureau Federation would like to congratulate the 4-H members on their very good efforts. The primary reason there is support for this 4-H program is recognition for the value in innumerable young lives of our very well structured and managed 4-H program. To hear Bonner County Commissioners consider doing away with the relatively small tax contribution to the Extension Office, 4-H and the Fair is troubling. Balancing budgets is a challenge, but the community contributions of the programs of the Extension Office, 4-H and the Fair are absolutely immeasurable. County government may talk all it wants about preserving our “Rural Way of Life” in Bonner County, but nothing speaks more emphatically for our real links to rural roots than gardening, forestry programs, 4-H and the Fair – for residents both urban and rural. While most Bonner County residents may agree with the concept of smaller government is better, there are many of us who feel the Extension Office and the Fairgrounds are essential components of “rural” life in this county. Totally Awesome Thursdays Coming in July! Bonner County 4-H will be hosting Totally Awesome Thursday day camps in July. These day camps are open to youth ages 8-18. Youth do not have to be in 4-H to participate. Thursday, July 28, Fun With Food. There is a registration fee of $10 per youth per day to cover supplies, snacks and beverages. Participants need to bring a lunch. Pre-registration is required to ensure we have enough supplies. Youth must pre-register by July 8, July 15, and July 22. For more information contact the Bonner County Extension Office at 263-8511.